Matti Salminen is one of the most respected operatic basses performing in the world today. He sings the major bass roles at the world's great opera houses (although he has been curiously absent from Covent Garden since 1980) and has a particular reputation for Wagner, the heavier Verdi roles, Mozart's Sarastro and Mussorgsky's Boris Godunov. Many of his major role assumptions are available on complete recordings of the relevant works on CD and DVD, and although he has never had the vocal suavity of a Ghiaurov or a Siepi, they do show a remarkable ability to bring warmth and humanity to each of his portrayals, which can often be a challenge in the bass repertoire. That warmth and humanity is the saving grace of this curious release from Ondine, entitled 'A Finnish Songbook'. There are 19 songs which all deal with either love or nature, usually both, with particular reference to the sea, which is invoked literally and as a metaphor for human situations. Eight composers are represented, including three settings from Sibelius. Three of the texts are traditional, with the remainder being by various different poets, and a lot of different arrangers are credited too, one of whom, interestingly, was an illustrious predecessor of Salminen's – the Finnish bass Kim Borg. Despite the number of different artists who have been involved in creating these pieces, the similarity of the subject matter amongst the poetry seems to have provoked fairly similar responses from them all, and truly, there are no real stand out songs amongst them. The impression is of an hour's worth of bucolic, sea-side melancholy which never seems to differentiate itself into either despair or elation. Perhaps the main problem with the material is that the texts are somehow more realistic than those used in a lot of the more usual vocal repertoire, and the situations do seem more like those encountered by ordinary people than the hysteria which singers are usually called upon to interpret. It is not until one looks closely at a translation of the text whilst listening to the songs that one can appreciate what Salminen is doing. He imbues each one with a direct sincerity as if he has lived every moment and is recounting it for the first time. If Salminen had lavished such artistry on Brahms or Schubert, there is no doubt that we'd have a world beating release on our hands. As it is, the disc comes across as a rather bland selection of songs that will be of interest to very few, and which makes for listening which will only be rewarding if one puts in the effort to follow the poetry word for word, effort which is only worth it because Salminen gives such an object lesson in communicating with the voice. Understandably given that he is in his early sixties, Salminen's voice wants for lustre occasionally, and one hopes that he will have the opportunity to record some more interesting and better chosen music before this factor becomes more concerning. 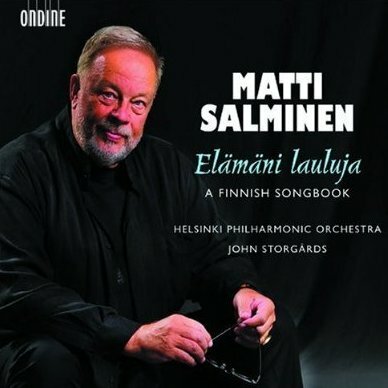 Of course, if you are a Finnish speaker, your experience of this recording will be different – Salminen's artistry will be more directly apparent, and the occasional onomatopoeic details in the orchestrations will charm you in the way in which they were intended, immediately and lightly, played beautifully by the Helsinki Philharmonic Orchestra under the able, supportive direction of John Storgårds. I would still contend, however, that an hour's worth of these songs will pall, and that three or four of them included on a mixed programme of other repertoire would have been a more enjoyable way for listeners to come across them.